However in the cinema people can definitely hear you s**t yourself – and given that I’m usually the world’s biggest scaredy cat (who famously threw his popcorn all over the place in Jurassic Park and could only watch Scream from behind a pillow) I was expecting the worst when I went to see Alien: Covenant last night. However – I thankfully managed to hold it together throughout, and was still mentally in one piece when it came to the walk home (alone and in the dark) from the cinema. It was an excellent movie and (if you’re into Alien – but maybe not so much if you’re expecting Finding Nemo) I urge you to go and see it. If you liked Prometheus then you’ll love this. I think it carries the narrative forward from that film really really well. I’d also strongly suggest watching the YouTube prologues before you go. They don’t spoil the film at all – and instead give you a little snapshot of the crew and their relationships, along with some of the back story associated with Prometheus. It will come as no surprise to most that there were other reasons however I wasn’t fully invested in being terrified. My blog late last night (link) describes one of the reasons – but the second is related to (as is customary for a Friday evening) my usual concerns about whether I’ve lost any weight – because it’s been a heavy week for exercising. In the past Angie at Slimming World has suggested that the (large amounts of) cramp I currently feel means my muscles will be retaining fluid as they repair and improve. This seemed to hold true last week when after a week where I didn’t deviate once from the plan I managed to put a pound on. Aside from my jogging attempts since then I’ve briskly walked over 70 miles – furiously pedalled around 20, done numerous upper body weights sessions and spent several hours working quite energetically in the garden. Consequently I’m aching. A lot. One can only hope that when I head off to be weighed shortly that this doesn’t mean I gain for a second week in a row. Not only have I been exceptionally active but you’d think I was bugs bunny if you’d have seen my dinners this week. I’ve eaten (rather large) salads fit for a king and generally thrown myself wholeheartedly into preparing really really healthy and tasty low calorie/syn food all week long. Well – I’ve recovered the pound I put back on and then some! This is a good result! I’m still not sure why I didn’t lose anything last week though. It didn’t really make much sense at the time and still doesn’t – but since I’ve managed to turn it around today I’m not going to dwell on it. It’s highly likely to be muscle mass/water retention related because I don’t think I’d lose this much otherwise. I’ve eaten properly – and I’m about as far from conventional ‘diets’ as you’re likely to get. I’ve just been consuming tons of good things and haven’t starved or deprived myself in any way. 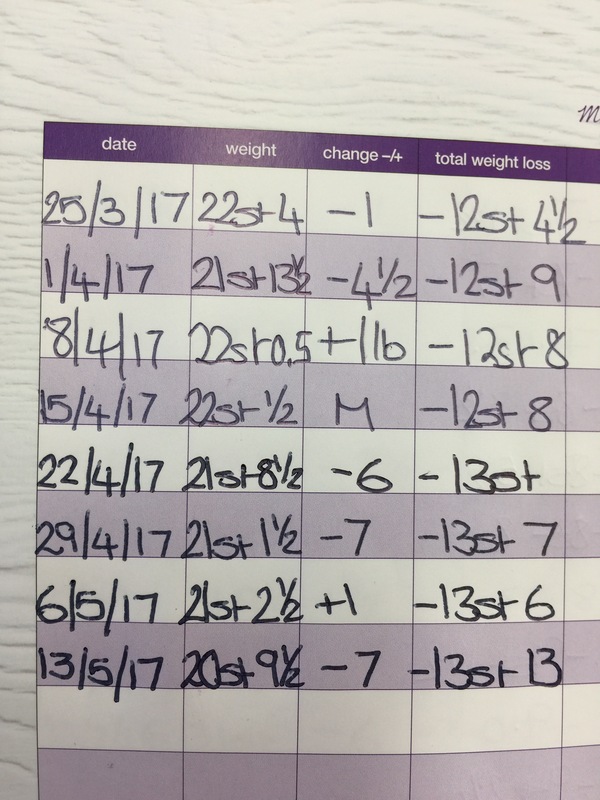 Interestingly if you add up the sum total of pounds lost and gained in the above shot over the course of 7 weeks I’m still managing to average 3.35 pounds p/w – which is awesome! Furthermore with today’s 7lb loss I’m now convincingly in the 20st weight bracket. I have only one pound to go and I’ll have lost fourteen stone!!! Anyway internet – I need to go out and get some more exercise. My legs feel like lead weights and my thighs are a tight cramped knot of pain and creakiness. The only fix for this is walking it (gently) off. I might see you while I’m out and about hobbling from A to B! Next Post: 44 inch victory! Congrats dear! 😀 Glad you had another big loss. 🙂 Sometimes our bodies just do crazy things that we don’t understand, but if you stick to the plan if should turn out alright ;). Wow, well done on this week’s result! I can beat your popcorn-spilling Jurassic Park incident though. My mum took me to the cinema to see it and during the electric fence scene I was so totally engrossed in it I stood up and shouted JUMP! Then promptly sank into my seat in shame as I realised what had happened and waited for the rest of the cinema-goers to stop laughing at me. At the time I was mortified, but now I miss being that invested in a film! My mom and I when I was quite small in the 80’s used to go to The Capital cinema in Alum Rock (Birmingham). It was a total flea pit that hadn’t been renovated since the 50’s and still had the red velvet seats with the (then still used) ash trays on the back of them. The cinema had a ‘house cat’ who used to sit warming itself on top of the popcorn machine in the foyer. We went to see ‘Shanghai Surprise’ (Madonna and Sean Penn) and in a particularly tense moment the jet black moggie ran past my mom’s feet in the dark. Hahaha fantastic! Isn’t that exactly what’s wrong with cinemas these days though? There just aren’t enough cats!